Salesforce Service Cloud empowers your service organization to interact with customers through any channel and provide an individualized experience that will be worth sharing—for your customers and for your company. 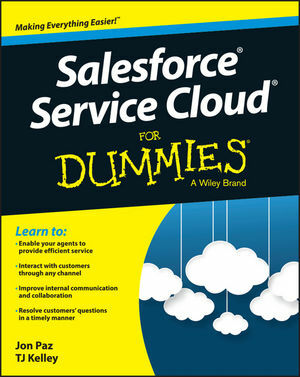 Salesforce Service Cloud For Dummies is one the first books to focus specifically on Salesforce Service Cloud software. With it, you'll discover how to set up a sophisticated support center for your business in a matter of a few hours. Whether you're a service executive, manager, support agent, or system administrator, you will discover how to maximize usage of Service Cloud through best practices and step-by-step guidelines. This book will help your customer service departments gain a holistic view of the customers they serve, and provide your customers with meaningful, efficient interactions. Take advantage of this opportunity to be heard above your competition with the help of Salesforce Service Cloud For Dummies. After working with various clients and industries to implement Service Cloud, Jon Paz has witnessed first-hand the transformative value of the product and evangelizes the need for it across verticals. TJ Kelley is a Salesforce.com partner and certified Service Cloud consultant.